I normally don’t have too many kitchen mishaps, but when I do it involves dried beans. Seriously, up until about a year ago every time I tried to cook dried beans everything seemed to go horribly wrong. I don’t now if it was the soaking part or the simmering part, but I just couldn’t seem to get it right. And to make matters worse, my husband’s favorite meal on the planet is beans and cornbread. Seriously. Anyway, being the determined little wife that I am I kept on trying and failing. Then one day someone told me to use my slow cooker. And just like that my dried bean curse was broken. Brilliant. As long as you give them enough time and make sure they are covered with water all day, then beans in the slow cooker will treat you right. I’m so glad because they are cheaper than canned beans and they freeze well. Yippee! So here is my recipe for bean success. Step 1: Cover beans with water to soak overnight. Step 3: Add water, oil and onion. Stir. Step 4: Set on low for 10-12 hrs or until soft. I checked my beans at the 6 1/2 hr mark and they were still crunchy so I turned them on high for 2 hrs to be done in time for dinner which also worked great! Step 5: Make cornbread. 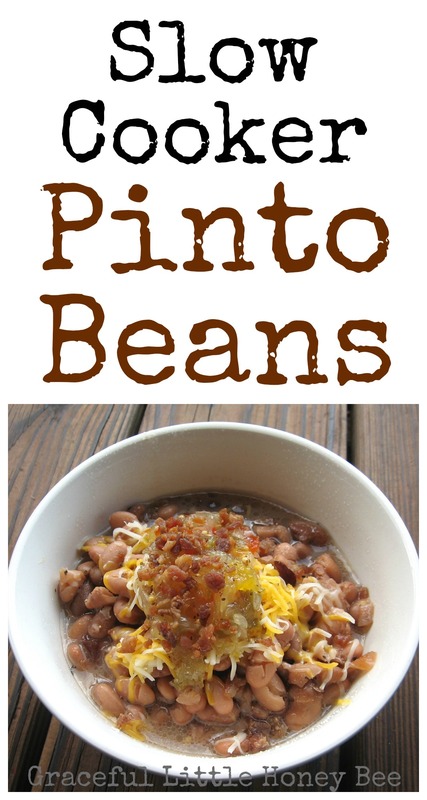 Because pinto beans without cornbread is just sad. Step 6: Let cool and top with all the trimmings!! *Don’t add salt or high acid foods such as tomatoes until the end because the beans won’t soften. Well there it is, the secret to perfectly cooked beans. I hope you will try this fabulously frugal recipe and let me know how it worked for you! What’s your favorite way to cook beans? Have you ever had a kitchen disaster? Cover beans with water to soak overnight. Next morning, rinse beans and place in slow cooker. Add water, oil and onion. Stir. Set on low for 10-12 hrs or until soft. Let cool and top with all the trimmings. Don't add salt or high acid foods such as tomatoes until the end because the beans won't soften. I freeze extra in quart-sized freezer bags. Are you looking for more easy slow cooker recipes? I,personally, have never had a bad experience cooking beans. But when I was a young girl my mother was cooking pinto beans in her pressure cooker and suddenly we heard a loud noise and the beans and the bean soup shot into the air and proceeded to saturate the kitchen ceiling. Once the mess was cleaned up and we gained our composure we had a good laugh. We just hated that we were not going to have those pinto beans with our turnip greens and corn 🌽 bread 🍞 for supper that night. Add salt to taste after the beans are cooked. Always add when cooking so flavor gets into the beans. Does anyone have a great cornbread recipe to share? One that isn't too sweet please. I use the one from the red and white Betty Crocker Cookbook. It's good. Your beans look delicious. I wanted to tell you how I have made my beans for years. I never soak my beans. I simply wash my dried beans and cook them on the stovetop. I add a few thick slices of salt pork, a couple of tablespoons of bacon grease, a couple teaspoons of chopped garlic, a medium sized chopped onion, a teaspoon of seasoned salt, a half tsp black pepper. I also brown a lb of smoked sausage. Chop that up and add to beans. I cover them in water by 3 to 4 inches. I simmer on low for several hours. Probably four to five hours. If they are too thin when done, I add some cornstarch to thicken. I serve them over rice. My beans are always soft. Being from Louisiana, I sometimes spice them up even more with Cajun seasoning. Try them sometime when you feel...spicy! Thanks for sharing. Sounds good! I am making those soon. Thanks for sharing your recipe too. I soak my beans overnight, rinse then cook covered with water is a saucepan on the stove top fir 30-40 minutes. Drain, cool and freeze in portion size snap lock bags. Perfect for large chick peas. I always add salt when I start cooking them. They're bland to me without seasoning them from the start. I just drop the dried beans straight into the crock pot cover them with an extra 2 inches of water, add a palmful of salt and cook on high for 4 hours. Perfect every time. For my veggie chili I add black, pinto, and kidney beans the same way and drop in a jar of salsa and the chili seasoning. Also comes out perfect. I'm curious why you mentioned not adding salt or acidic foods. I've never had any issues with them. Thanks!! I seriously never thought anyone could not cook dried beans. I clean the beans, removing small rocks, bits of dirt, rotten looking beans. Rinse under faucet, or if rinsing in the pot, at least three washings. I have never soaked beans. Use a pot big enough for them to expand. Cover with about 3-4 inches water. Medium heat, until beans are just simmering. If you needed to keep beans covered, add hot, boiling water. Cook until tender. If you cook them too slow, they turn dark and remain hard. People used to add a bit of salt pork, jowl or belly meat, to beans or peas. The super-market salt pork will work, but it's not the same. Too salty, for one thing. You can soak it in milk awhile to remove some salt. For some real goodness, buy an un-cooked smoked ham. Don't forget, this ham meat needs to be cooked. Slice the meat off for cooking later. (Fried ham, eggs and hot biscuits.) You will have chunks left that are too small to slice, but save them to cook in beans. Then boil the bone and trimmings in plenty of water. Remove the bone and trimmings. Let the broth cool, then skim and discard the fat. Freeze pints of this broth to cook beans in. One pint of broth for 1 cup of beans. About an hour before beans are done, add some of the chunks of ham from when you sliced the ham. If the ham is cooked too long, it loses it's flavor. I package the chunks enough for one pot of beans and freeze them. This works wonders for white beans, such as Great Northern. I have only been cooking for 75 years or so. Honey, you forgot to say to pick &sort the beans to remove any debris & bad beans and then rinse three times to remove dirt first !! This has to be done Before you soak ! Not everyone knows to do that ! And if you bring them to boil and let them boil about 5 minutes, then turn off and soak overnite, they will cook faster. My worse kitchen failure was due to beans. One Friday afternoon, I put a bowl of beans in water to soak overnight planning to make a bean stew the next day but not long after putting the beans in the water we were invited away for the weekend. I thought that the beans would be fine left to soak but Boy was I wrong. When we came home Sunday night we could barely enter the house due to the most horrific stench. The culprit was the now fermenting beans! Do the beans not need salt? I put relish on my beans as well. When I was a kid, mom canned chow-chow and we used that on our beans. Mom would use ham, bacon or bacon fat in her beans. If she didn't have any of those, then she would use plain oil. Beans were always served with cornbread and greens, my favorite was turnip greens with a little vinegar sprinkled on top. Oh, we always had onions. To go with it. That was some good eatin'!! My Mom and Grandma taught me to add 1 or 2 T of baking soda to the soaking water. It reduces the amount of gas produced by eating beans. Just be sure to rinse them well before continuing cooking and adding the rest of your ingredients. You can add more seasonings after the cooking is done. Do you use the liquid the beans cook in? Yes, I just add the beans, liquid and all to recipes. I guess I make these little different from everyone else. First, you have to make sure thete are no rocks, dirt or bad beans in the bafmg. Rinse at least 3 times. Put the beans in a Dutch oven or slow cooker. Cover with water so that the beans are submerged about 2 inches. I used to add salt pork, but have found bacon works just as well. I add about three strips of bacon and salt and pepper. I cook them on top of the stove about three hours, or until the beans are very soft and a nice soup has formed. In a slow cooker, I cook them about 6 hours on low or 4 hours on high. Onion is served on the side, a long with corn muffins and crispy fried potatoes and some spinach. They are so good. I also don't soak the beans. I have not noticed a difference in them whether I do or not.si I just don't bother. DON'T try this with kidney beans! They have a toxin n the (phytohemagluttanin) that causes severe digestive distress (I won't go into details but it ain't pretty!). AL beans have these substances but kdney beans have the hghest concentraton by ar. To be safe, though, the following procedure has been recommended by the PHLS (Public Health Laboratory Services, Colindale, U.K.) to render kidney, and other, beans safe for consumption: * Soak in water for at least 5 hours. * Pour away the water. * Boil briskly in fresh water for at least 10 minutes. * Undercooked beans may be more toxic than raw beans. I've never heard of this and I cook kidney beans in my crock pot all of the time. We've never gotten sick or had any stomach issues from them. I'm in the U.S. if that makes any difference. I use 2 Tablespoon of bacon grease. My mother used it in her beans. Better yet, after soaking all night. Rinse well. Cook in sauce pot for at least an hour then put in crock pot on medium all day. Broth will get nice and thick. Mom always does this. I really enjoy your recipes. Would this recipe be suitable for canning? I haven't canned beans, but I know that you can with a pressure canner. I actually soak mine in salt water and they cook just as fast. When I was working I did the crock pot thing now I put them on the stove for a couple of hours. Waala. You might find it surprising but try adding a couple tablespoons of creamy peanut butter and you get just a touch of nutty flavor. Handed down from me from one of those grandmas. What size slow cooker do you use for the 2lb bag of beans? Would it make a difference if a med size crock pot is used? I need to measure my slow cooker because I'm not sure, but I believe that it is a 7 qt.